Senior captain Lexi Schmalz (pictured) reaches pack to corral a pass in the neutral zone on a rush up the ice. Sophomore forward Caroline Han (9) corrals a loose puck and fights off a stick check midway through the second period. The Needham High girls varsity hockey team has had some memorable moments against Weymouth in the last several years, most notably a 2-1 overtime win in the first-round of the Division I state tournament in 2017. On Saturday, the two Herget Division rivals met at Babson for the second and final time this season with the Lady-Rockets (9-2-2, 6-2-0) looking to complete the season sweep after a 3-1 victory against the Wildcats (1-11-2, 0-7-1) on January 9. To put it simply: Needham came to play. 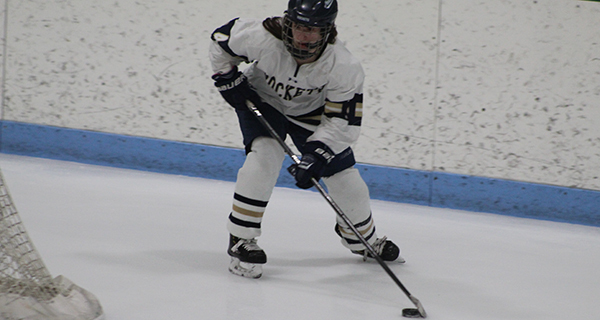 Behind hat tricks from senior captain/forward Lexi Schmalz (3g, 2a) and freshman forward Britt Nawrocki (3g,1a), the Lady-Rockets cruised to a 9-1 victory. With 8:19 to play in the opening period, Nawrocki broke in on a mini-breakaway, deked to her backhand and briskly deposited the puck home on her backhand to give Needham the early 1-0 lead. 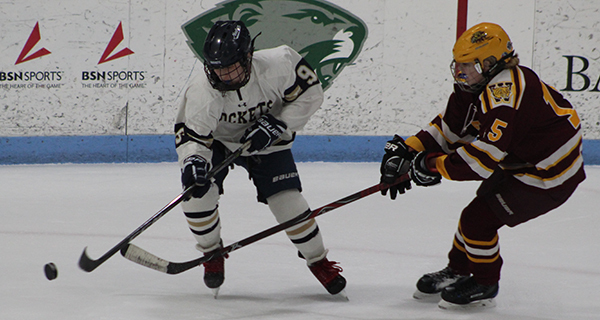 Sophomore forward Grace Kelley doubled Needham’s lead to 2-0 moments later with a power play goal to give the Rockets a two-goal lead at the first intermission. Weymouth cut the deficit to 2-1 early in the second period, but all it did was awaken the beast that was Lexi Schmalz and Needham’s forward corps. Following the goal by the Wildcats, Needham erupted for six goals: three from Schmalz for the hat trick, two from Nawrocki to complete her hat trick, and one from sophomore forward Maddy Foster. When the dust had settled, Needham took a commanding 8-1 lead into the second intermission. Junior forward Celia Blaszkowski (pictured) operates the puck behind the Weymouth net during the Needham girls 9-1 victory against the Wildcats on Saturday. Junior forward Celia Blaszkowsky added some insurance to push the lead to 9-1 early in the third period, and the Rockets prevailed by the eight-goal final. Following the victory, the Needham girls moved into the top-10 of the latest Hockey Night in Boston rankings at No. 10. The Lady-Rockets will host division-leading Braintree (12-3-0, 8-0-0) on February 9 at Babson in an absolutely huge game that could decide the Herget title and determine which team receives the much-desired higher seed in the upcoming Division I tournament.